Are you or people in your organization feeling overwhelmed with their workload? Do they feel they are not getting the results they want from the actions they are taking? Does everything seem urgently important? Despite our best intentions, life has a way of becoming complicated. People, tasks, responsibilities, deadlines, and even recreation all compete for our attention. The human brain however, simply does not respond well to the stress of juggling multiple priorities. That’s where Personal Kanban can help. Adaptable to all ages and situations, and accessible to all learning styles, Personal Kanban allows us to visualize the amount of work we have, and the way that work is carried out. Unlike other personal productivity tools, Personal Kanban is a pattern – it is not an edict. You can mold it into whatever shape or form works best for you at the time. Personal Kanban is also scalable – it can work with just you, or with your family, or even with work groups. 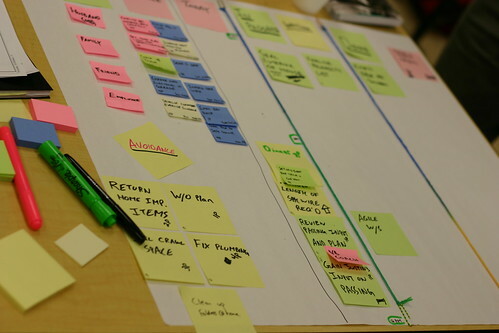 Based on the book Personal Kanban, participants will apply Kanban and other techniques to manage their own work, and by extension to teams. Each person will design and learn how to use their own activity board. The power of slack time! The workshop is lively, interactive, with lots of variety to maximize learning potential. Gerry co-designed this session using the Training From the Back of the Room approach, which uses brain science principles to make learning stick. Attendees of the full day training are eligible to earn 7 PDUs towards PMI certification, 3 PDUs for the half day. Performance occurs at many levels: organization, team and individual, starting with the individual. High performing companies embrace all three to reap the rewards of excellence. Executives, managers, staff, entrepreneurs, busy moms can all benefit from this workshop. "The workshop is a fun ride through several Agile techniques that I can turn around and put to use right away!" "Attend the workshop. It allows you to reflect on where you can make personal effectiveness improvements and teaches you how to do it." "Now I can see better what I need to do and have a flexible means to manage my work." "I plan to have my team participate in this exercise." All full day participants receive a copy of the book Personal Kanban, a $25 value. Participants leave excited and motivated to try something new. After a month, that enthusiasm may lessen due to life pressures (how ironic! ), lingering questions about use and/or need to adjust the board. We'll conduct a 60 minute group coaching call in early January to see how Personal Kanban is working for you, and help you make the necessary adjustments. This is an exclusive offer to workshop participants. Gerry's passion is helping people create extraordinary results. He uses innovative approaches including (Personal) Kanban, Innovation Games® and Lean Startup to guide individuals and organizations to produce higher value, increase productivity and quality, delivered by highly motivated, empowered teams. In all, Gerry has over fifteen years of IT industry experience and 6 years experience as a management consultant. Gerry also speaks regularly at industry conferences as a recognized expert in Agile methods, including the largest conference each year, Agile 2010 and 2011. Based in Sault Ste. Marie, ON, Gerry works with companies of all sizes across North America, from startups to large enterprises.